This MHP episode offers an informal interview with China historian Jeff Wasserstrom, where he discusses a variety of topics about writing history. He gives advice on publishing book reviews, overcoming writer’s block, and names some of his favorite history books. Jeff also speaks about the Writing History seminar he led at UC Irvine this past Fall. 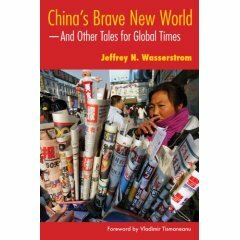 Wasserstrom’s latest book, China’s Brave New World , was featured on a list of Pankaj Mishra’s favorite books of 2007. Mishra writes, “In this book Jeffrey Wasserstrom shows why he is one of the most sensible writers on a subject that most Western writers spoil with either paranoia or excessive awe.” Jeff is also a member of The China Beat blog team. Stay tuned for next week’s episode of MHP with Laurel Thatcher Ulrich, AHA president-elect and author of Well-Behaved Women Seldom Make History . This entry was posted in books, podcast, writing and tagged book reviews, booklist, China Beat, graduate school, Jeff Wasserstrom, journalism, Laurel Ulrich, podcast, teaching, writer's block, writing, writing history. Bookmark the permalink.